Tom Veitch took over as regular writer of Animal Man with #33, accompanied most often by artist Steve Dillon — whose clearly communicative but simplistic artwork would later lead to fame on Preacher. Veitch continued the title’s weirdness, though in a lighter, more traditionally comic tone than that of Morrison or Milligan. Animal Man’s powers continued to malfunction. After they killed every animal in the San Diego Zoo, the Baker family moved to the farm of Ellen’s mother in Pownal, Vermont. Whereas Morrison had simply featured other animal-related characters, Veitch now began forming a unified theory of such characters in a move echoing Alan Moore making Swamp Thing an earth elemental during his run on that character’s title. Meeting a Native American shaman (which echoed the Native American themes of Morrison’s run), Animal Man learned that he was one of a group called the Animal Masters, who were natural guardians of nature. He also learned that the cause of his powers malfunctioning was the coming of Antigon, the natural arch-adversary of the Animal Masters. Antigon finally manifested in Veitch’s final issues, and the villain corrupted, possessed, and killed B’Wana Beast, revealed to be a fellow Animal Master. Along with Vixen and Tristess, other Animal Masters, Animal Man defeated Antigon in #50, Veitch’s final issue. Buddy Baker also learned during this time that his own daughter, Maxine, was herself an Animal Master and was developing powers similar to her father’s. While both Peter Milligan and Tom Veitch are capable writers, their work on Animal Man suffered by being in the shadow of Grant Morrison’s. 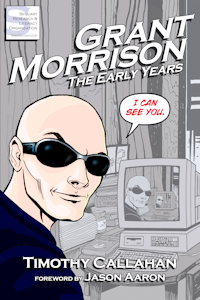 Any successor had to be as different as Morrison had been — while simultaneously keeping elements of Morrison’s run for his fans. Milligan’s run, closest to Morrison’s, nonetheless lacked the gravity granted Morrison’s weirdness. And while Veitch’s work remains laudable for its attempt to do for Animal Man what Alan Moore had done for Swamp Thing, any leniency one exercised in one’s judgments was long worn thin by the time Animal Man and the ridiculously named Animal Masters, a group of second-stringers not granted much personality, battled the generic super-foe Antigon. Writer Jamie Delano, chosen to follow Veitch as writer, would instigate several changes on the title — including the fulfillment of Veitch’s attempt to unify the Animal Man mythos as Alan Moore had Swamp Thing’s. Tagged Animal Man, Steve Dillon, Tom Veitch.